Find holiday villas for rent with sea view Puerto del Carmen. You can’t beat the sea view of this villa! It has 3 bedrooms and 2 bathrooms and can sleep 6. We have just returned from a fabulous villa holiday in Puerto del Carmen, which we booked through Karen rom Holidays4u.org. She was very helpful and quick to respond during the booking process which set us off to a good start. We were delighted to discover on arrival that the villa has wifi internet access. It ought to be standard in all villas these days. It’s surprising how much you miss the internet if you don’t have it. The owners had also left a welcome pack for us which included water, red and white wine, coffee, milk etc. It was a nice touch and very welcome as we arrived on a late flight. Another thing that we were very impressed with was the quality of the beds. The mattresses were very comfortable – not too hard or too soft. It really does ruin a holiday if you have uncomfortable beds. The only negative comment would be that the heating hadn’t been turned on in the pool as we requested. But after a phone call to the owner, the heating was turned on immediately and was at a good temperature by the following day. 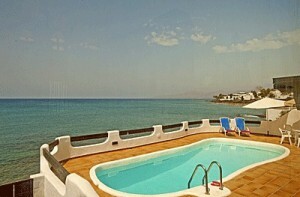 We booked a villa in the central part of Puerto del Carmen for the summer holidays last Summer. We chose one with air conditioning and wifi internet access, as my husband has his own business and needs to keep an eye on things at work, even while on holiday. The weather was very hot, so the air con was very welcome. We thoroughly enjoyed our holiday and would definitely return to this villa.